Mevlut Mert Altintas, an Ankara riot police officer who shot Russian Ambassador to Turkey Andrey Karlov dead, refused to go through an X-ray scanner and was let in by security guards after presenting his police ID, according to local media. 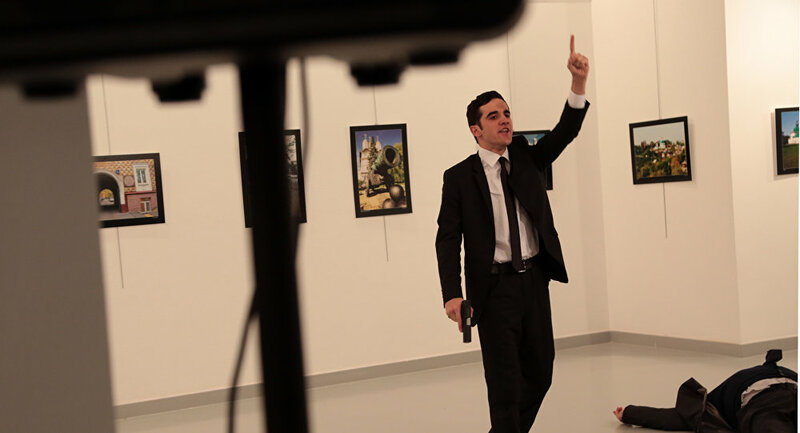 MOSCOW (Sputnik) — The man who killed Russian Ambassador to Turkey Andrey Karlov entered the Ankara exhibition hall where the diplomat was due to speak without going through security checks, Turkish media reported. Mevlut Mert Altintas, an Ankara riot police officer who shot Karlov dead on Monday, refused to go through an X-ray scanner and was let in by security guards after presenting his police ID, the Hurriyet Daily reported. The ambassador was rushed to a hospital where he was pronounced dead 40 minutes after the gun attack, according to the Russian Foreign Ministry, which described it as an act of terrorism. The 22-year-old gunman mentioned Syria and shouted "God is great" during the attack. He was reportedly shot down by police. The Turkish government said the murderer wanted to disrupt Ankara’s ties with Moscow.